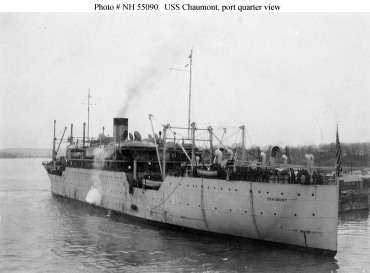 The USS Chaumont was initially an auxiliary transport commissioned in 1921. USS Chaumont, one of twelve 13,400-ton (displacement) Hog Island Type B (Design 1024) transports built for the U. S. Shipping Board at Hog Island, Pennsylvania, was laid down in November 1918 as the Shipping Board's Shope, launched in March 1920 as the U.S. Army's Chaumont, and completed a few months later. Excess to Army needs, she was transferred to the Navy and commissioned in November 1921. From her home port at San Francisco, Chaumont commenced a career of trans-Pacific troop service that initially consisted of voyages between California and Manila via Honolulu. Two or three voyages in 1925-26 took her to Shanghai instead of Manila, and she continued to stop at Shanghai at least once during most subsequent years. In August 1926 she sailed from San Francisco through the Panama Canal to Annapolis. The return trip took her to Norfolk, where she was drydocked for routine maintenance, and then to Guantanamo. Such voyages between the East and West Coasts also became near-annual events. Chaumont's voyages to Shanghai provided important assistance to U.S. Far Eastern diplomacy during the 1920s and 1930s by supporting the Marine Corps units deployed to the International Settlement in that city to protect U.S. nationals there. At the end of January 1932 Japanese forces in the Settlement attacked nearby Chinese forces, leading to intensive fighting in the city. Chaumont was in Manila at the time, and on 31 January the Navy Department ordered her to embark the 1,000 men of the Army's 31st Infantry Regiment and sail for Shanghai. Responding rapidly, Chaumont cleared Manila with the troops on board on 2 February and arrived at Shanghai on the 5th. Five years later, in mid-September 1937, Chaumont rushed the 6th Marine Regiment to Shanghai to reinforce the 4th Regiment that was protecting the Settlement during the all-out Japanese effort to seize the city from tenacious Chinese defenders. Chaumont suffered two mishaps during her China service in 1936-37, a week-long period aground at Chingwangtao and a collision at Shanghai with the Italian cruiser Raimondo Montecuccoli. When the Japanese attacked Pearl Harbor, Chaumont was on one of her regular voyages from Hawaii to Manila. She was diverted to Darwin, Australia, and then sent back to the West Coast. After two runs to Pearl Harbor, the now elderly transport was assigned to service between Seattle and Alaska, bringing men and supplies to assist in the defense of the Aleutians. Selected in March 1943 for conversion to a hospital ship, Chaumont was decommissioned in August at Seattle. She returned to active service in March 1944 as Samaritan (AH-10) and retained that name and designation until she was sold for scrapping in early 1948. Further details on the ship's history can be found at navy.mil and Wikipedia. Also see the list of her ports of call for July 1937 through July 1941 as found at the National Archives. One of her most important contributions, when in the Pacific, was aiding in the collection of meteorological information used by the Weather Map Service of the Asiatic Fleet. She also carried military supplies, Marine expeditionary forces, sailors and their dependents, and occasionally members of congressional committees on inspection tours, calling at ports from Shanghai to Bermuda. This Rice Barge Marines page http://www.ricebargemarines.com/character.htm (no longer in existence) mentioned the Chaumont twice, once sailing from "Chinese waters" 25 June 1934 and arriving in San Francisco on 4 August. The second mention is when the subject of the story leaves Mare Island Navy Yard in California (northeast of San Francisco, in the North Bay subregion of the San Francisco Bay Area) "for a leisurely Pacific crossing, arriving in Chinese waters on 15 May  and transferred briefly to the heavy cruiser, USS Augusta (CA-31) for the final leg of the voyage, to Shanghai." After an abortive attempt at across-the-board modernization in the early Depression years, virtually all OP-20-G's attempts to increase manpower and improve equipment during the 1930s were directed toward the Pacific basin where the Japanese threat was seen as paramount. In 1937, OP-20-G opened the long anticipated major research unit in Hawaii with the task of supporting Washington's efforts. Lieutenant Commander Thomas Dyer was detached from fleet duty and assigned to COM-14 as a cryptanalyst. His duties were to establish a decrypting unit and undertake research work on "M1 Orange Naval Cryptographic System." Message files for 1935, 1936 and 1937 were supplied by OP-20-G and sent to Dyer via the USS Chaumont. COM-16 sent copies of all traffic, including messages intercepted by Stations A, B, and C to Dyer, and Washington mentioned that IBM equipment would be forthcoming at once. At the outset, when not occupied by other duties assigned by COM-14, Dyer, who was not a Japanese linguist, single-handedly attempted to recover all keys as they appeared. He naturally forwarded all solutions to Washington for translation. In 1939, when the M1 system had been exhausted, Dyer was assigned cryptanalytic responsibility for the Japanese Navy's Flag Officers Code. Lieutenant Joseph Richardson appeared the following July as language officer. Both Laurence Safford and A/CNO RADM Royal E. Ingersoll indicated (Pearl Harbor Attack Hearings Before the joint Committee on the Investigation of the Pearl Harbor Attack, Congress of the United States, 79th Congress, hereafter PHA, part 26, 388 and part 9, 4241, respectively) in their testimonies that they believed Hawaii was responsible to CINPCAC; Safford in his testimony to the Hart inquiry, Ingersoll while being cross-examined by Kimmel during the congressional investigation. it was Safford, of course, who in 1937 opened the office, assigned Dyer and others to COM-14, and allocated all cryptanalytic tasks until 1942. Memorandum from CNO to COM-14, 21 August 1937, "Cryptanalysis, Orange M1 System" Series III.H.17, CCH History Collection (classified). The M-1 was a Kana cipher machine used by the Japanese navy from July 1933 for about four years. It is described in RIP28. Jack S. Holtwick, A Guide to Foreign Cryptographic Systems: U.S. Navy Short Titles, Cover Names, and Nicknames, 14 June 1971. NSA Cryptologic Archival Holding Area (classified). The book Secret Messages: Codebreaking and American Diplomacy, 1930-1945 by David Alvarez also mentions the Chaumont in connection with signals intelligence in the years immediately before World War II. In the second chapter, "Launching a Service", Alverez is describing how the U.S. Army's SIS or Signal Intelligence Service was established in 1929 after eight years of the Code and Cipher Compilation Section consisting of little but its Director and the Chief Cryptanalyst of the Signal Corps, William Friedman. In 1929, the Signal Corp decided to hire four junior cryptanalysts and establish the SIS. Friedman was struggling to train his junior cryptanalysts, and the Coast Guard was the main source of communications intelligence as it intercepted and worked to break the ciphers of alcohol smugglers during the years of Prohibition in 1920-1933. In 1933 the army still had no facilities dedicated to intercepting foreign communications. The few intercepts that dribbled into the offices of SIS were the product of private initiative. In San Francisco, Lieutenant Colonel Joseph O. Mauborgne, a signal officer attached to the Ninth Corps Area, set up a receiver in the basement of his quarters. While off-duty in the evenings, he searched the airwaves for foreign stations, recording the call letters and frequencies of those he consistently heard and seeking to determine their locations and those of the stations with which they communicated. At a time when the Signal Corps had little experience with radio intercept and none at all with traffic analysis. Mauborgne's effort was pathbreaking. This conscientious officer (who made violins in his spare time and may have been the only career office in the army to have been educated at the Art Institute of Chicago) also copied and mailed to Washington any traffic that, in his opinion, might interest the Signal Corps or army intelligence. Some of this material, mostly Japanese, found its way to Friedman's office. Mauborgne's initiative was modest in scope and obviously no substitute for a systematic intercept program. In 1932 the army had taken some tentative steps toward establishing such a program, although here, too, an individual provided the initial push. Captain John Ferriter, a Signal Corps officer in the Philippines Department, had developed an interest in radio intercept and its intelligence potential especially with regard to Japan. In Manila, Ferriter observed that high-frequency Japanese commercial stations were easily copied, but low- and intermediate-frequency transmissions of the sort used by the Japanese army were not readily heard. During a voyage to China in the summer of 1932, the young captain convinced the radio officer of his ship, the USNT Chaumont, to let him experiment with montoring foreign stations, a project he continued during visits to U.S. Army detachments station in China under various treaty arrangements with the Chinese government. Upon his return to the Philippines, Ferriter submitted a report outlining the potential for radio intercept against Chinese, Japanese, and Russian military stations, identifying three locations in China (Peking, Chefoo, and Tientsin) as possible sites for intercept facilities and urging the army to establish a school to prepare radio operators for Far Eastern intercept operations. J. O. Mauborgne to G-2, Ninth Corps Area, 12 September 1932, Intercept/Crypto Correspondence, 1927-1941, Box 781, Historic Cryptologic Collection (HCC), National Security Agency. Captain John Ferriter to Department Signal Officer (Philippines), 1 August 1932, SIS. General Files, Box 778, Historic Cryptologic Collection (HCC), National Security Agency. Bill has compiled a partial list of former crewmen of the USS Chaumont and USS Samaritan, as well as the similar converted USS Henderson and USS Bountiful. Bill's father served on board the Chaumont/Samaritan. Contact me for a copy of that list. Voyages November 1941 through 1946, from Janes All the World's Fighting Ships 1941; Dictionary of American Naval Fighting Ships vols II, VI. 29 Nov 1941 departed Pearl Harbor for Manila. Diverted 7 Dec 1941 to Suva, Fiji, Brisbane, and Darwin. Landed at Darwin 5 Jan 1942. Returned to Bisbane at end of Jan 1942, then to Sydney, Wellington, Balboa (Canal Zone), and San Francisco 29 Mar. Made two runs San Francisco to Pearl Harbor and return (8 May, 24 Jun) then several Seattle to Alaska and return (including various Alaskan ports 16 Jul, Seward 10 Aug, various ports 12 Sep, Kodiak 18 Sep). Decommissioned 28 Aug 1943, reclassified 2 Sep as hospital ship USS Samaritan (AH-10), recommissioned 1 Mar 1944. After 25 Mar 1944 made two runs San Francisco to Pearl Harbor and return. Returned to Pearl 11 May, continued to Kwajalein, treated Saipan casualties 17 Jun to 1 Jul. Sailed to Saipan, on 8 Jul departed for Noumea, New Caledonia, and returned to Saipan 1 Aug.
Evacuated patients from Guam to Guadalcanal, and from Peleliu to Russell Islands, Aug and Sep 1944. Sustained major hull damage running aground on Tannu Reef at 0325 24 Sep 1944 en route to the Russell Islands. Brief overhaul at Espiritu Santo, served as base hospital at Ulithi until sailing for Iwo Jima 16 Feb 1945. Arrived at Iwo Jima 20 Feb, evacuated 606 patients to Saipan. Returned to Saipan 25 Feb, made two runs to Guam. Left Ulithi for Okinawa 9 Apr, arriving 13 Apr. Made several evacuation runs from Okinawa to Saipan until sailing for Pearl 1 Jul. Took patients on board, sailed to San Francisco, returned to Pearl 10 Sep, then to Sasebo. Supported occupation forces until 15 Mar 1946. Returned to San Francisco 23 Apr 1946, decommissioned 25 Jun 1946. For the Chaumont's brush with notoriety, Wallis Simpson was an American socialite who in 1934 became the mistress of Edward, Prince of Wales at the time. Two years later in 1936, after he had become King, she divorced her second husband and King Edward asked her to marry him. In December of 1936 he abdicated the throne and married her six months later. Before that, in 1916 she had married Earl Winfield Spencer, a U.S. Navy aviator. They separated in 1920, got back together in 1921, and separated again in 1922, freeing her to continue her affair with the Argentine diplomat Felipe de Espil. In early 1924 she sailed to China aboard the Chaumont. Her husband happened to be stationed there as commander of the USS Pampanga. She entered into the society of Europeans in China and had an affair with Count Galeazzo Ciano, who later became Benito Mussolini's son-in-law and Foreign Minister. She spent over a year in China. Both she and her husband were back in the U.S. by September 1925, although living apart, and their divorce was finalized in December 1927. By that point she was already involved with Ernest Aldrich Simpson, an Anglo-American shipping executive and former officer in the British Army's Coldstream Guards. In 1928 he divorced his wife to marry Wallis. This set her up in society to the point where in 1931 she could meet Thelma, Lady Furness, who then was the mistress of Edward, Prince of Wales. Wallis managed to take her place as Royal Mistress in January of 1934. King George V died in January, 1936 and Edward became King Edward VIII. In December of that year, he abdicated the throne. His brother Albert became King, taking the name of George VI. The new king gave Edward the title "His Royal Highness Edward, Duke of Windsor." Edward moved to Austria and Wallis moved to France until her divorce was finalized. They married in June 1937 and became the Duke and Duchess of Windsow. They moved to France, living on Edward's tax-free allowance from his brother the King and supplementing this income with illegal currency trading. They traveled to Germany in 1937 to meet Hitler, where they dined with his deputy Rudolf Hess and visited a concentration camp. 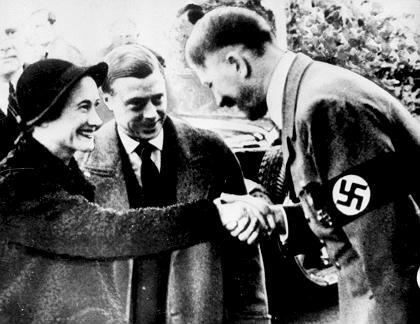 The Duke and Duchess of Windsor with Adolf Hitler in 1937. "Tell Mussolini's Foreign Minister I said 'Hello'!" Edward was made the Governor of the Bahamas during World War II, as Churchill figured that was the place where he could do the least damage. While Governor of the Bahamas, Edward he told a journalist "It would be a tragic thing for the world if Hitler was overthrown" and told an acquaintance "After the war is over and Hitler will crush the Americans ... we'll take over ... They [the Commonwealth] don't want me as their king, but I'll soon be back as their leader." He blamed civil unrest in 1942 over low wages on "men of Central European Jewish descent, who had secured jobs as a pretext for obtaining a deferment of draft", and in 1950 he blamed World War II on British Foreign Secretary Anthony Eden's treatment of Mussolini "and of course Roosevelt and the Jews." It's fortunate that Wallis Simpson led Edward to abdicate the throne.